I had to confess that I was not a navigator, that I had never looked through a sextant in my life, and that I doubted if I could tell a sextant from a nautical almanac. And when they asked if Roscoe was a navigator, I shook my head. Roscoe resented this. He had glanced at the “Epitome,” bought for our voyage, knew how to use logarithm tables, had seen a sextant at some time, and, what of this and of his seafaring ancestry, he concluded that he did know navigation. But Roscoe was wrong, I still insist. When a young boy he came from Maine to California by way of the Isthmus of Panama, and that was the only time in his life that he was out of sight of land. He had never gone to a school of navigation, nor passed an examination in the same; nor had he sailed the deep sea and learned the art from some other navigator. He was a San Francisco Bay yachtsman, where land is always only several miles away and the art of navigation is never employed. So the Snark started on her long voyage without a navigator. We beat through the Golden Gate on April 23, and headed for the Hawaiian Islands, twenty-one hundred sea-miles away as the gull flies. And the outcome was our justification. We arrived. And we arrived, furthermore, without any trouble, as you shall see; that is, without any trouble to amount to anything. To begin with, Roscoe tackled the navigating. He had the theory all right, but it was the first time he had ever applied it, as was evidenced by the erratic behavior of the Snark. Not but what the Snark was perfectly steady on the sea; the pranks she cut were on the chart. On a day with a light breeze she would make a jump on the chart that advertised “a wet sail and a flowing sheet,” and on a day when she just raced over the ocean, she scarcely changed her position on the chart. Now when one’s boat has logged six knots for twenty-four consecutive hours, it is incontestable that she has covered one hundred and forty-four miles of ocean. The ocean was all right, and so was the patent log; as for speed, one saw it with his own eyes. Therefore the thing that was not all right was the figuring that refused to boost the Snark along over the chart. Not that this happened every day, but that it did happen. And it was perfectly proper and no more than was to be expected from a first attempt at applying a theory. The acquisition of the knowledge of navigation has a strange effect on the minds of men. The average navigator speaks of navigation with deep respect. To the layman navigation is a deed and awful mystery, which feeling has been generated in him by the deep and awful respect for navigation that the layman has seen displayed by navigators. I have known frank, ingenuous, and modest young men, open as the day, to learn navigation and at once betray secretiveness, reserve, and self-importance as if they had achieved some tremendous intellectual attainment. The average navigator impresses the layman as a priest of some holy rite. With bated breath, the amateur yachtsman navigator invites one in to look at his chronometer. And so it was that our friends suffered such apprehension at our sailing without a navigator. During the building of the Snark, Roscoe and I had an agreement, something like this: “I’ll furnish the books and instruments,” I said, “and do you study up navigation now. I’ll be too busy to do any studying. Then, when we get to sea, you can teach me what you have learned.” Roscoe was delighted. Furthermore, Roscoe was as frank and ingenuous and modest as the young men I have described. But when we got out to sea and he began to practice the holy rite, while I looked on admiringly, a change, subtle and distinctive, marked his bearing. When he shot the sun at noon, the glow of achievement wrapped him in lambent flame. When he went below, figured out his observation, and then returned on deck and announced our latitude and longitude, there was an authoritative ring in his voice that was new to all of us. But that was not the worst of it. He became filled with incommunicable information. And the more he discovered the reasons for the erratic jumps of the Snark over the chart, and the less the Snark jumped, the more incommunicable and holy and awful became his information. My mild suggestions that it was about time that I began to learn, met with no hearty response, with no offers on his part to help me. He displayed not the slightest intention of living up to our agreement. “Here we are.” When we looked at the blank space and asked, “And where is that?” he answered in the cipher-code of the higher priesthood, “31-15-47 north, 133-5-30 west.” And we said “Oh,” and felt mighty small. So I aver, it was not Roscoe’s fault. He was like unto a god, and he carried us in the hollow of his hand across the blank spaces on the chart. I experienced a great respect for Roscoe; this respect grew so profound that had he commanded, “Kneel down and worship me,” I know that I should have flopped down on the deck and yammered. But, one day, there came a still small thought to me that said: “This is not a god; this is Roscoe, a mere man like myself. What he has done, I can do. Who taught him? Himself. Go you and do likewise—be your own teacher.” And right there Roscoe crashed, and he was high priest of the Snark no longer. I invaded the sanctuary and demanded the ancient tomes and magic tables, also the prayer- wheel—the sextant, I mean. And now, in simple language. I shall describe how I taught myself navigation. One whole afternoon I sat in the cockpit, steering with one hand and studying logarithms with the other. Two afternoons, two hours each, I studied the general theory of navigation and the particular process of taking a meridian altitude. Then I took the sextant, worked out the index error, and shot the sun. The figuring from the data of this observation was child’s play. In the “Epitome” and the “Nautical Almanac” were scores of cunning tables, all worked out by mathematicians and astronomers. It was like using interest tables and lightning-calculator tables such as you all know. The mystery was mystery no longer. I put my finger on the chart and announced that that was where we were. I was right too, or at least I was as right as Roscoe, who selected a spot a quarter of a mile away from mine. Even he was willing to split the distance with me. I had exploded the mystery, and yet, such was the miracle of it, I was conscious of new power in me, and I felt the thrill and tickle of pride. And when Martin asked me, in the same humble and respectful way I had previously asked Roscoe, as to where we were, it was with exaltation and spiritual chest-throwing that I answered in the cipher-code of the higher priesthood and heard Martin’s self-abasing and worshipful “Oh.” As for Charmian, I felt that in a new way I had proved my right to her; and I was aware of another feeling, namely, that she was a most fortunate woman to have a man like me. Cross low on the horizon. Proud? No medicine man nor high priest was ever prouder. Furthermore, with the prayer-wheel I shot Alpha Crucis and from its altitude worked out our latitude. And still furthermore, I shot the North Star, too, and it agreed with what had been told me by the Southern Cross. Proud? Why, the language of the stars was mine, and I listened and heard them telling me my way over the deep. Proud? I was a worker of miracles. I forgot how easily I had taught myself from the printed page. I forgot that all the work (and a tremendous work, too) had been done by the masterminds before me, the astronomers and mathematicians, who had discovered and elaborated the whole science of navigation and made the tables in the “Epitome.” I remembered only the everlasting miracle of it—that I had listened to the voices of the stars and been told my place upon the highway of the sea. Charmian did not know, Martin did not know, Tochigi, the cabin-boy, did not know. But I told them. I was God’s messenger. I stood between them and infinity. I translated the high celestial speech into terms of their ordinary understanding. We were heaven-directed, and it was I who could read the sign-post of the sky!–I! I! And now, in a cooler moment, I hasten to blab the whole simplicity of it, to blab on Roscoe and the other navigators and the rest of the priesthood, all for fear that I may become even as they, secretive, immodest, and inflated with self-esteem. And I want to say this now: any young fellow with ordinary gray matter, ordinary education, and with the slightest trace of the student-mind, can get the books, and charts, and instruments and teach himself navigation. Now I must not be misunderstood. Seamanship is an entirely different matter. It is not learned in a day, nor in many days; it requires years. Also, navigating by dead reckoning requires long study and practice. But navigating by observations of the sun, moon, and stars, thanks to the astronomers and mathematicians, is child’s play. Any average young fellow can teach himself in a week. And yet again I must not be misunderstood. I do not mean to say that at the end of a week a young fellow could take charge of a fifteen-thousand-ton steamer, driving twenty knots an hour through the brine, racing from land to land, fair weather and foul, clear sky or cloudy, steering by degrees on the compass card and making landfalls with most amazing precision. 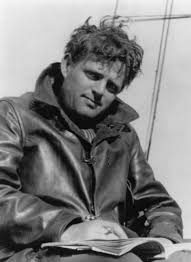 But what I do mean is just this: the average young fellow I have described can get into a staunch sail-boat and put out across the ocean, without knowing anything about navigation, and at the end of the week he will know enough to know where he is on the chart. He will be able to take a meridian observation with fair accuracy, and from that observation, with ten minutes of figuring, work out his latitude and longitude. And, carrying neither freight nor passengers, being under no press to reach his destination, he can jog comfortably along, and if at any time he doubts his own navigation and fears an imminent landfall, he can heave to all night and proceed in the morning. As I write these lines I lift my eyes and look seaward. I am on the beach of Waikiki on the island of Oahu. Far, in the azure sky, the trade-wind clouds drift low over the blue-green turquoise of the deep sea. Nearer, the sea is emerald and light olive-green. Then comes the reef, where the water is all slaty purple flecked with red. Still nearer are brighter greens and tans, lying in alternate stripes and showing where sandbeds lie between the living coral banks. Through and over and out of these wonderful colours tumbles and thunders a magnificent surf. As I say, I lift my eyes to all this, and through the white crest of a breaker suddenly appears a dark figure, erect, a man-fish or a sea-god, on the very forward face of the crest where the top falls over and down, driving in toward shore, buried to his loins in smoking spray, caught up by the sea and flung landward, bodily, a quarter of a mile. It is a Kanaka on a surf-board. And I know that when I have finished these lines I shall be out in that riot of colour and pounding surf, trying to bit those breakers even as he, and failing as he never failed, but living life as the best of us may live it. And the picture of that coloured sea and that flying sea-god Kanaka becomes another reason for the young man to go west, and farther west, beyond the Baths of Sunset, and still west till he arrives home again. But to return. Please do not think that I already know it all. I know only the rudiments of navigation. There is a vast deal yet for me to learn. On the Snark there is a score of fascinating books on navigation waiting for me. There is the danger-angle of Lecky, there is the line of Sumner, which, when you know least of all where you are, shows most conclusively where you are, and where you are not. There are dozens and dozens of methods of finding one’s location on the deep, and one can work years before he masters it all in all its fineness. The difference between the two positions was something like eighty miles. Yet we knew we had not travelled twenty miles. Now our figuring was all right. We went over it several times. What was wrong was the observations we had taken. To take a correct observation requires practice and skill, and especially so on a small craft like the Snark. The violently moving boat and the closeness of the observer’s eye to the surface of the water are to blame. A big wave that lifts up a mile off is liable to steal the horizon away. But in our particular case there was another perturbing factor. The sun, in its annual march north through the heavens, was increasing its declination. On the 19th parallel of north latitude in the middle of May the sun is nearly overhead. The angle of arc was between eighty-eight and eighty-nine degrees. Had it been ninety degrees it would have been straight overhead. It was on another day that we learned a few things about taking the altitude of the almost perpendicular sun. Roscoe started in drawing the sun down to the eastern horizon, and he stayed by that point of the compass despite the fact that the sun would pass the meridian to the south. I, on the other hand, started in to draw the sun down to south-east and strayed away to the south-west. You see, we were teaching ourselves. As a result, at twenty-five minutes past twelve by the ship’s time, I called twelve o’clock by the sun. Now this signified that we had changed our location on the face of the world by twenty- five minutes, which was equal to something like six degrees of longitude, or three hundred and fifty miles. This showed the Snark had travelled fifteen knots per hour for twenty-four consecutive hours—and we had never noticed it! It was absurd and grotesque. But Roscoe, still looking east, averred that it was not yet twelve o’clock. He was bent on giving us a twenty-knot clip. Then we began to train our sextants rather wildly all around the horizon, and wherever we looked, there was the sun, puzzlingly close to the sky-line, sometimes above it and sometimes below it. In one direction the sun was proclaiming morning, in another direction it was proclaiming afternoon. The sun was all right—we knew that; therefore we were all wrong. And the rest of the afternoon we spent in the cockpit reading up the matter in the books and finding out what was wrong. We missed the observation that day, but we didn’t the next. We had learned.